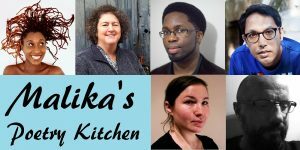 Malika’s Poetry Kitchen is a community of poets dedicated to developing their craft. Founded in 2001 and based in London, the collective’s influence on the contemporary poetry and spoken word scene has reached far beyond the capital. This is a unique opportunity to hear the work of two Kitchen founders, Malika Booker and Jacob Sam La Rose, plus Jill Abram, Rishi Dastidar, Seraphima Kennedy and Peter Raynard.